Polished 18kt white gold case with the Breguet signature "coined/fluted" edge. 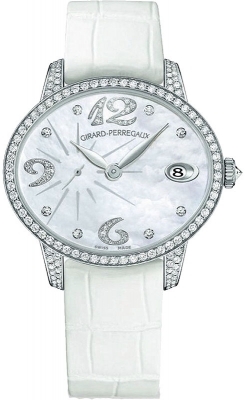 Bezel set with 2 rows of diamonds - totaling 140 diamonds & weighing in at a total of +/- 1.14 carats. Case is slightly curved to fit for a comfortable fit on the wrist. 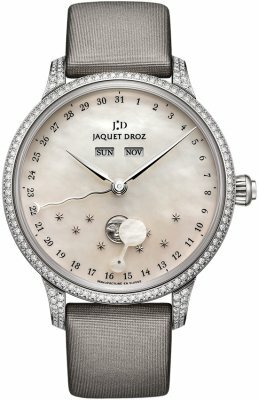 Mother of pearl round center with engraved hour segmentation & a very fine "flinque alterne" sunburst guilloche texture. Domed silver chapter ring with printed minute track. 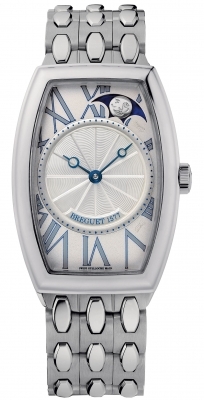 Flat frosted/matte silver outer rim with blue rimmed & silver filled stylized Roman Numeral hour markers. Blued steel "Breguet Style" hands. Moonphase aperture with a rose gold gilt moon at the top right corner of the dial. Breguet Caliber 586L , beats at 21,600 vph, contains 38 Jewels & has an approximate power reserve of 36-40 hours - fitted with a flat silicon balance-spring.